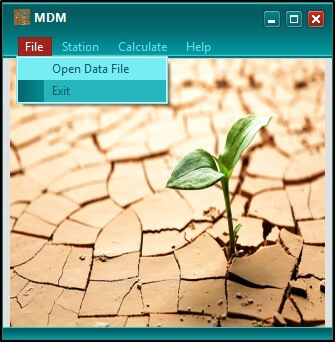 How can we run MDM software and what is difference between MDM and RDIT? You have two options for registration, A-you can fill the online form on MDM software and the software will register without contact to AgriMetSoft. B- You can contact to kolsoomi57@gmail.com for registration key for your email. The user should register, enter the email address, and finally approve that he/she will cite to the related paper. 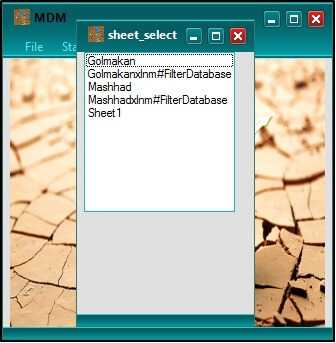 Then, the user can start to run "MDM". By clicking on the menu "File" as Fig.1, the user can open the data file of desirable station. There two options in the File menu, namely "Open data File" and “Exit”. If the user select the first option, he/she can browse the data. When the data file was selected, then the desirable sheet should select (Fig. 2). Fig. 2 After browsing the file, select the sheet. After the sheet has been selected, the user can assign the variables according to the Fig. 3. It is a simple process. 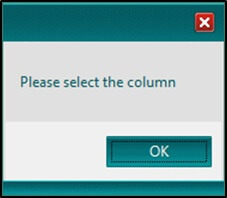 Firstly, user would select "Years" RadioButton and its column header in the ComboBox and click on "Load". 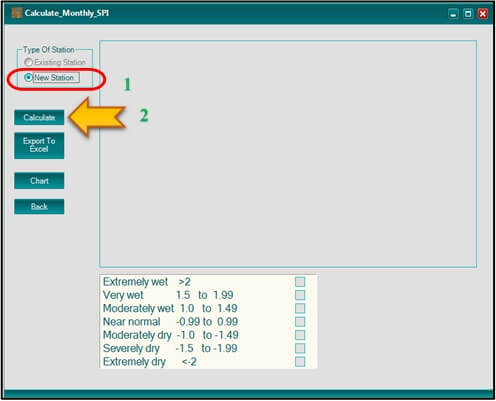 Secondly, user would select "Precipitation" RadioButton and its column header in the ComboBox and click on load. Thirdly, the user should select the time scale of data and then click on "Back and Set". In this step, by selecting "Calculate" option from the menu bar. 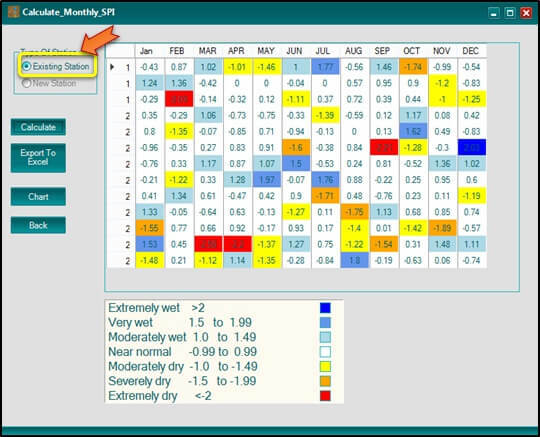 In the open window there are eight rain-based drought indices. In this example, we select "SPI". As you can view in the Fig. 4, there are different scale for this index, namely “Monthly”, “Yearly”, and “Moving Average”. In this example we’ve selected the first one. By selecting the desirable index with proper time then the user can click “Ok” button and will face to the Fig. 5. In this figure as you viewed, there are two options in the “Type of Station”. When the user load a data file of a station, then in this step she/he would click on the “New Station” (Fig. 5, No.1), then press the “Calculate” button (Fig. 5, No.2). In the Fig. 6, the values of SPI was presented with different color in different class. If in the values of an index in the table, you can face to a number with this amount “1E+...”, it refers to a Null value (Not a Number). Fig. 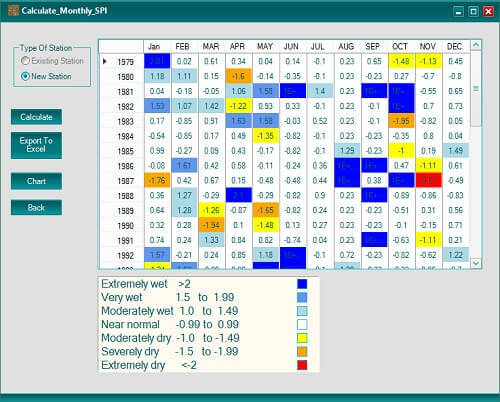 4 selection of rain-based indices. Fig. 5 Select the type of station. Fig. 6 The values of SPI in monthly scale. When a user wants to observe the graph of an index, so he/she can do it. If the “Chart” button was clicked then the user face to a message, same as Fig. 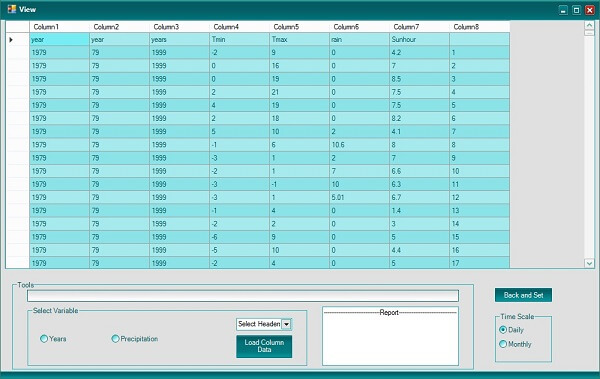 7, that it refers to select a desirable column (month) to depict the amounts of the selected index. 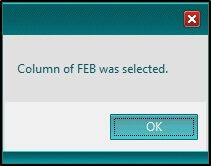 Then the user selected a column by clicking on it then a message was shown to her/him that revealed the specific month was selected (Fig. 8). Then the selected chart was presented (Fig. 9). 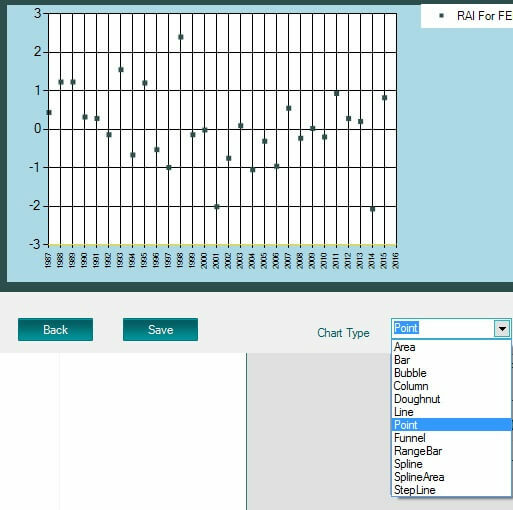 There are different type of charts that the user can select them from the “Chart Type” option (Fig. 10). 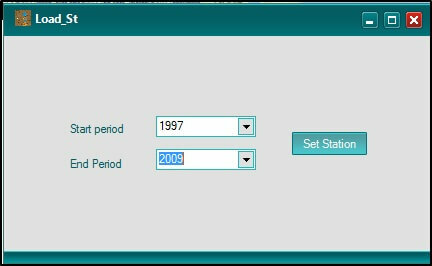 If the user wants to select the database of AgMERRA, then he/she can select the option that is located in the “Station” menu bar (Fig. 11). Then a window will open with the title of “Station” as in Fig. 11. In this window there are two tabs, namely “Coordinate” and “Map”. 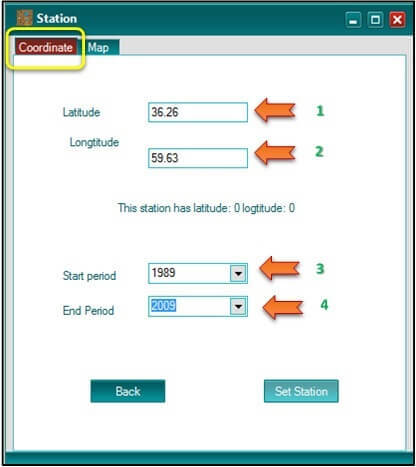 If the user select the “Coordinate” tab, then the latitude and longitude of the desirable area should write in the related field (Fig.11, No. 1 and No. 2). Furthermore, the user would enter the start and the end of period that wants (Fig.11, No. 3 and No. 4). 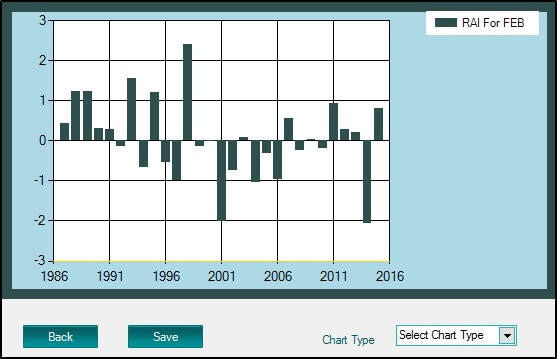 The AgMERRA data starts from 1980 to 2010, so if the user wants to use this database, he/she should aware of the available period (1980-2010). Finally, the user can click on the "Set station" button. 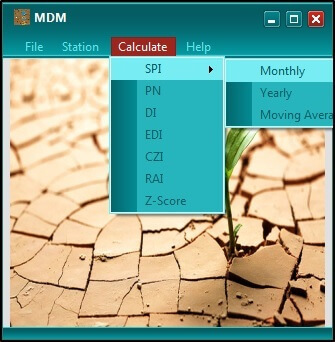 Another option that is available in the MDM software is “Map” tab that the user can click on a map and select the desirable point from the map. 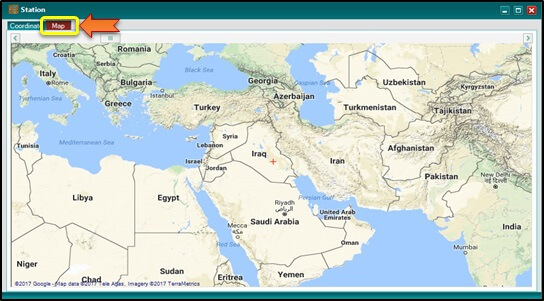 By selecting the “Map” tab, the new window will open, and the user can click on the map in a desirable point. By this activity, the selected latitude and longitude was shown on the window. Then with the selected Lat and Lon the user will face to the Fig. 13. In this Fig the user can enter the desirable period according to the database of AgMERRA (1980-2010), then all the calculations will be for the entered period. With clicking on the “Set Station” button, after a while you can view “Successfully loaded”. Finally, you can select the desirable index (as pervious step), and according to the Fig. 14, for the “Type of station”, you select the “Existing station”. Fig. . 13 The period of selected point according to AgMERRA’s database.